For my second week participating in Outdoor Wednesday I had planned on posting pictures from my photo hike at Weedon Island in Saint Petersburg, Florida. Well, as they say, "the best laid plans…often go awry" and in this case they did. The weather was beautiful, but the scenery was on the blah side for someone who loves color. Lost in a sea of green with an occasional glimpse at some of our native wildlife, I ended up taking very few pictures. One of our mangrove trees that I took was used for Monday's Oceanic Blog-A-Thon in honor of the first official Worlds Ocean Day. If your interested, you can read my post here. With that said, I've decided to post some of my favorite photos. I love taking close-up shots of flowers and that's what I'm going to share with you today. On Mother's Day this year, my son surprised me by flying in from California and showing up at my door unannounced. What a good son! After I recovered from the initial shock we decided to visit the Florida Botanical Gardens, which happen to be just blocks from my house…I mean tiki hut. We were rewarded with beautiful weather and beautiful blooms. 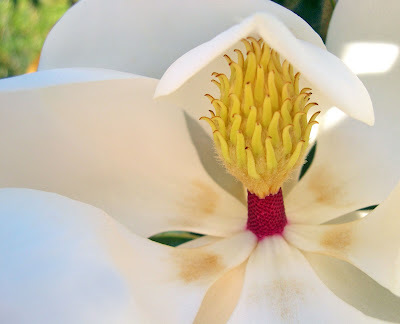 This is the magnificent Magnolia grandiflora "Little Gem." After my son's visit, I headed to the other coast of Florida to visit my cousin in Neptune Beach. Again, the weather was beautiful…for two days. Then we had a downpour for the next five days! You may have seen it on the news, it was that bad. So, we couldn't visit Jekyll Island as we had planned and Merritt Island was even worse. Not to be outdone, we headed to a local shopping plaza that has beautiful landscaping. 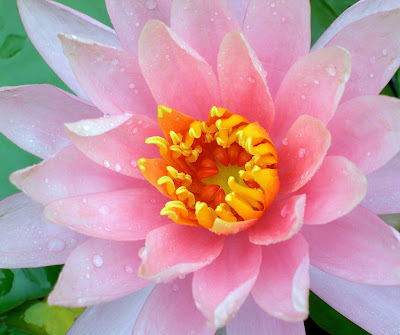 The rain let up for a minute and I managed to get this shot of a water lily in one of the ponds. 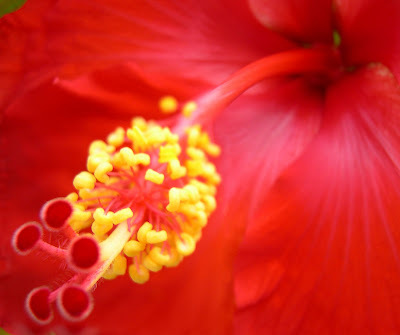 Last year I was taking pictures of one of the hibiscus plants in my yard and this is the result. Hibiscus need adequate water and because of the watering restrictions we have in place now, my hibiscus are pathetic this year. My soil is very sandy and watering once a week doesn't cut it for hibiscus. So, for this year I will look back at once was a pretty plant. One plant in my yard that will survive anything is the Mexican Sunflower. Nothing kills this plant and believe me I've tried. My sister bought a couple of "sticks" at a local plant fair a few years ago and it is trying to take over our yard. Right now both plants are about 15 feet tall despite having been cut down to the ground before winter. We are determined to remove them, but the flowers are gorgeous and we always get compliments from passersby. I decided to take a few pictures to remember them by and while I was doing this I had a little visitor who decided to stay and ham it up for the camera. My favorite staycation here in Florida is Dunedin, a quaint little town filled with fabulous restaurants, wonderful shopping, and great art galleries. My favorite place to stay is the Meranova Inn — the best bed and breakfast ever! A beautiful Red Passion Vine covers one of the fences and I spent the afternoon earlier this year taking photos. One of my favorite flowers are plumerias and I'm lucky enough to have one in my backyard. I bought this plant as a cutting almost twenty years ago and it stands about 12-feet tall now. Last summer four seed pods formed and I am waiting for them burst open, so that I may start my own little plumeria farm. I use plumeria a lot in my designs and I've decided to carry it a step further. 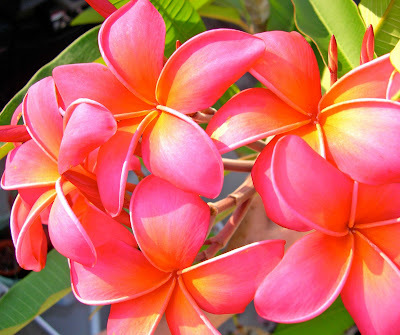 Plumerias just whisper tropical beaches and breezes to me! So, there you have it, a peek into one of my passions. I hope you've enjoyed your visit, now surf over to visit Susan @ A Southern Daydreamer for links to other Outdoor Wednesday posts! Hi Ellen and thanks for visiting. No, I just lifted some of the shadows in Photoshop to enhance the color and then softened it a bit to give that dreamy look. These beautiful photos are a feast for the eyes. Love, love, love them. You are an incredible talent. Keep up the amazing photography. Your plumeria is stunning!We have a yard full of them.I can't get enough.They propagate so easily. Love the passion vine too. The pictures are stunning! So many pretty flowers. What a shame you didn't go to Jekyll Island. I've been there before and really liked it. The bed and breakfast you mentioned in Dunedin sounds wonderful. Goodness gracious! You have a great camera and a great eye! Those pictures are REALLY lovely. What beautiful photographs. Thank you for sharing them with us. Have a wonderful day. I am drooling over your close-ups. Please, do tell what type of camera you are using. I am desperate to up grade my basic point and shoot Nikon Coolpix. Also, I am truly blown away by your son’s work just from the thumb nail pix. I am going to wander over and take a look at the post. Hope you are having a great day at the hut! Those are some amazing shots of some really beautiful flowers! You're making me miss the tropics!!! Beautiful flowers! Beautiful photos! Thanks for sharing. We are having water restrictions here in southern California as well. I'm afraid all my flowers are going to die! Wow...one fantastic shot after another... Talk about upclose and personal. 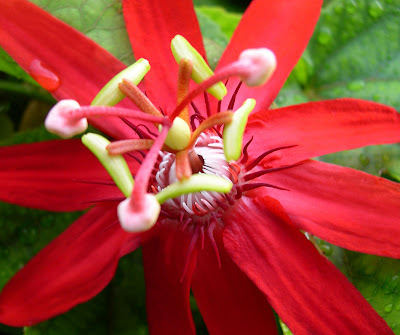 Your flower photos are breathtaking, Rhonda! Wish I had a red hibiscus in my yard... all of ours are pink. Nice, but *wow* that red one just knocks me off my feet! Btw, I identified your #3 shell of the week last night; my answer is in that post's comments. Beautiful gorgeous shots. Thanks for the tip about the Mexican sunflower. 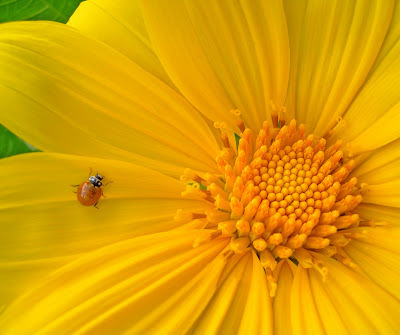 I have been looking for something to place along a sunny fence and the ladybug on your photo is perfect. We love the whole Tampa Bay, Clearwater and Dunedin area. It's about a 90 minute drive, but we try to get over as often as we can. Thanks for your good wishes. I really appreciate it. Aww, thanks so much for your sweet comments. I will definitely have to look into that site you suggested. ;) Those flowers are so pretty! They make me happy. Thanks for stopping by to visit me and leaving your nice comment.